Fuchsia is perfect for hanging baskets on a front porch, and for a lot of people it’s a staple flowering plant. A lot of the time it’s grown from cuttings, but you can easily grow it from seed, too! Keep reading to learn about fuchsia seed collecting and growing fuchsias from seed. 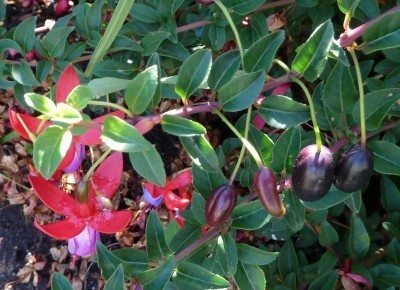 How Do I Harvest Fuchsia Seeds? The reason fuchsia is usually grown from cuttings is that it hybridizes so easily. There are over 3,000 varieties of fuchsia, and the chances a seedling will look just like its parent is pretty low. That being said, if you aren’t counting on a specific color scheme, growing fuchsias from seed can be fascinating and exciting. If you have multiple varieties, you can even cross pollinate them yourself and see what you get. After the flowers have bloomed, they should form fuchsia seed pods: berries that range in color from purple to light or dark green. Birds love these berries, so make sure to cover them with muslin bags or they’ll all disappear. The bags will also catch them if they fall from the plant. Give the berries a squeeze through the bag – if they feel soft and squishy between your fingers, they’re ready to pick. Slice them open with a knife and scoop out the tiny seeds. Do your best to separate them from the flesh of the berry, and lay them out on a paper towel. Let them dry overnight before planting them. Saving fuchsia seed takes a little more drying. Leave your seeds out on the paper towel for a week, then store them in an airtight container until spring. Growing fuchsias from seed usually results in flowering seedlings the very next year, so you can see the fruits of your cross pollination (maybe a brand new variety) right away.